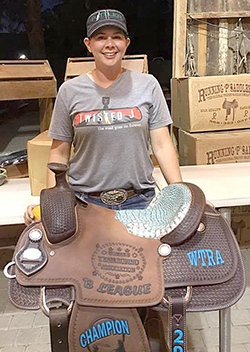 LIVERMORE, CA – The WTRA Finals were held Aug. 5 at Basso’s Arena. The turnout was very good and everyone seemed to have a nice time. The moderate weather was greatly appreciated. The roping went smoothly without a hitch. At the end of the day we held the awards ceremony in the beautiful barn and lots of really nice awards were given out. The year-end banquet also took place down in the barn. The great food is always something we look forward to. Thank you Charlie and Sandy Inderbitzen for all your hard work. We so appreciate you guys. What a beautiful place to have our Finals. The WTRA is underway with bigger and better things to come in our future. I think our 2018 Finals will be something that no one will want to miss, so we will keep you all posted. Girls, this is a good time to get your memberships in. With the changes that are about to take place within the WTRA, I think you will be sorry if you don’t become a part of our association. The new year has just begun and there is a lot of roping to be done. Please contact Donna Mahoney by text at (707) 272-2747 or Lisa Smith at (805) 459-2654 or go to www.roperssportsnews.com to download a membership form, rule book and win sheets. Saddles were awarded to the high point #2.5 & under, Chris Darger and #3 & over, Jake Juenemann. Karen Dias was awarded a $1,000 Chute Help gift certificate for being the high point girl of the Finals roping. 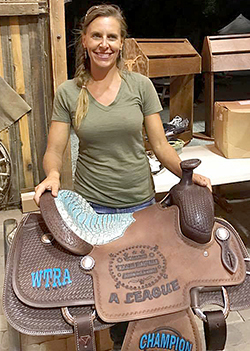 Running P saddles were awarded to the champion in each league, reserve won a Skyline buckle. Top 10 awards included Oxbow beaded headstalls, Pegasus Equine boots, wall mount jewelry frames and rope baskets made by Connie Duncan. Top 10 heelers received Oxbow beaded spur straps. 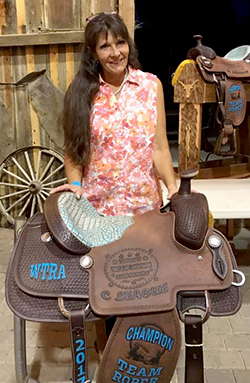 Please note that because WTRA rules state that you cannot win a year-end saddle two years in a row or two saddles for the year, Karen Dias was awarded a buckle in the A League, so Chris Darger won the saddle. Lori Niesen won both the Heeling and C League categories. 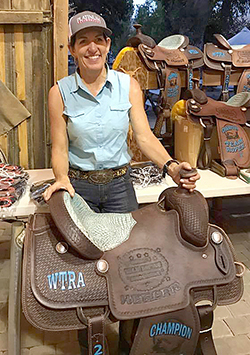 She chose the heeling saddle so Anne Brett was awarded the saddle. 1st go: 1. Heidibecca Kucera and Rigo Estrella, 7.52, $105. 2. Kyndall Green and Kevin Dias, 8.09, $62. 3. Russ Piazza and Dillon Almason, 8.18, $42. Average: 1. Chris Darger and Tom Magee, 27.74, $344 + Les Vogt Bits. 2. Chris Darger and Kevin Dias, 29.62, $284 + Pegasus boots. 3. Karen Dias and Chris Burgess, 29.75, $225 + Oxbow beaded spur straps. 4. Mike Kutchera and Dillon Almason, 29.76, $166. 5. Joseph Pedota and Kevin Dias, 30.15, $107. 6. Donna Mahoney and AJ Kevie, 36.48, $60. 1st go: 1. Karen Dias and Joseph Shawnego, 5.51, $144. 2. Rigo Estrella and Joseph Shawnego, 5.63, $86. 3. Mike Potts and Jesus Hernandez, 5.85, $58. Average: 1. Mandy Niesen and Jesus Hernandez, 29.48, $449 + Best Ever Pads. 2. Rick Corum and Joseph Shawnego, 29.48, $449 + Les Vogt Bits. 3. Mike Potts and Brian White, 29.64, $326 + Oxbow beaded spur straps. 4. Karen Dias and Jesse Beam, 31.71, $245. 5. Karen Dias and Jake Juenemann, 33.79, $163. 1st go: 1. Brittany Dias and Jillian Murray, 7.35, $31. 2. Karen Dias and Christine Tidwell, 7.73, $21. Average: 1. Ann Brett and Lorilee Niesen, 47.30, $146 + Best Ever Pads. 2. Chris Darger and Kim Collins, 51.15, $88, + Oxbow beaded bronc halters. 3. Mandy Niesen and Kim Collins, 23.63 on 2, $58 plus belt purses. 4. Mandi Mahoney and Jillian Murray, WTRA caps. Average: 1. Joseph Pedota and Jake Juenemann, 20.67, $279 plus Pegasus boots. 2. Joseph Pedota and Kevin Dias, 20.94, $209 plus Oxbow beaded spur straps. 3. Rigo Estrella and Jake Juenemann, 23.29, $139. 4. Karen Dias and Brian White, 25.19, $70. WTRA President Donna Mahoney (l) presents saddles to winners of the high point of the day at the WTRA Finals, Chris Darger, #2.5 and under and Jake Juenemann, #3 and over. 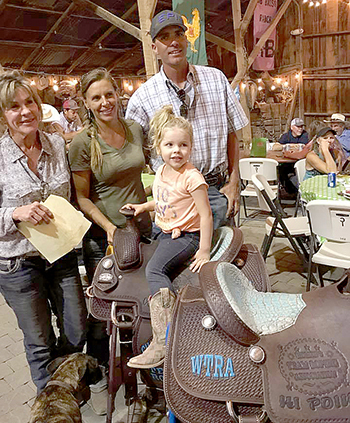 A League saddle winner was Chris Darger. B League champion Keely Kirkman. C League champion Anne Brett.